It is our hope that this book will be an exciting adventure for the reader, as it was exciting for those of us who have lived through it and are living through it now. In a sense it is historical because it deals with the period from about 1960 to the present. However, it also seeks to capture the nature of the researchers’ experiences in the development and elaboration of their research and applied interests. In the academic world, we often talk in terms of how our early intellectual interests and training influenced the kinds of research issues and questions we study, the theoretical approaches we test, and the methods that we use to deal with these issues and questions. However, this is only partly true. The actual process is somewhat different and the events that occur to guide us are not always as technical as they sound, and these events and their ramifications are what makes it very exciting. The book will describe how we started out in our respective research careers by providing some of the early finding from our respective research efforts dealing with the relationships of traditional demographic variables such as age, education, occupation, race, marital status, migration, social mobility, etc., to psychological health measures of various kinds and to subjective evaluations of quality of life; and how migration and social mobility emerged as fundamental issues to be dealt with in this process. The process begins with our early findings which were quite different from the general thinking and data in the several social science disciplines, i.e., “serendipitous” or unexpected findings. These findings led us to re-think the definitions, the explanations of the earlier findings, and reevaluate the methods that prevailed. From these efforts, new thinking and explanations were required. It also resulted in new research with these new insights and new methods that were appropriate for evaluating the new thinking. In more technical terms, we were looking for new theories and explanatory models to account for the findings; and we needed revised or different research methods for evaluating them. 4.4 What Can We Learn from the Early Studies? 9.2.1 Is it Important to Know the Values and Norms of the Cultural Context from Which the Migrant Came to Explain Psychological Health Status? 9.2.2 Is the Nature of the Communication Between the Migrant and His/Her Parents to the Family Important Factors in His/Her Psychological Health Status? 9.2.3 Is It Important to Know with Whom the Migrant Moved? 11.8.3 How Redundant are Status Opportunity Structure and Economic Security? Prior to 1969, Dr. Kleiner was involved in major research funded by American funding sources including the National Institute of Mental Health. During those same years, Drs. Dalgard (now deceased) and Sorensen were also involved in major research funded by Norwegian sources, including the Norwegian Research Council. In 1969, Dr. Kleiner came to Norway as a Research Professor, funded by both American (including Fulbright) and Norwegian (including the Norwegian Research Council) funding sources. In 1969, the three researchers first met and immediately found that their theoretical and research interests overlapped dramatically; they immediately began forty-one years of collaboration in research and publications. In the l980s and l990s, much of their research was in Norway and funded, in the main, by Norwegian sources. This included Dr. Kleiner working at the Center for Social Network and Health at Ulleval Hospital during the 1990-1991 academic year. However, during this period, their research has also included, at various times, psychological health, juvenile delinquency, suicide, crime, subjective quality of life (or sense of well-being), general health issues, twin studies and mental disorder, etc. Here they will use the concepts of psychological health status and felt quality of life as the main outcome concepts, and the various operational definitions of the outcome measures used in the intervening years will be subsumed under these concepts. During the early years, they were primarily concerned with traditional epidemiological studies in which correlation studies were made relating demographic variables such as migratory status, social mobility, and ethnicity to incidence and prevalence of the various individual and social problems of interest to them, individually or collectively at the time. As these efforts developed and expanded, it became more and more evident that their assumptions and others’ assumptions as well about the meanings and importance of such variables were highly questionable. In the process, variables were defined more precisely which had major implications for their significance and for the task of the researcher. This required the researcher to learn about the social and cultural properties of the locus of socialization, learn about the socialization process itself, and the meaning of the relevant variables and experiences to those experiencing them.. The theoretical origins and influences on their thinking derive from the pioneering and seminal work of Kurt Lewin and Alexander Leighton (a student of Adolph Meyer). This book is for all those in the different social sciences and service disciplines that are interested in social and psychological problems that need to be studied and acted upon, i.e., the merger of ‘basic’ and ‘applied’ orientations. 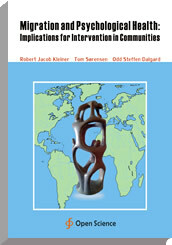 That is also why the title includes ‘Psychological Problems and Intervention.’ The book is also for those policy makers, administrators in health related governmental and community agencies, and community leaders that are interested in dealing constructively with these problems in their areas of concern. For a few people interested in migration, social mobility, and social change as intellectual issues of interest, these issues are important and need to be included in any historical-sociological-anthropological-psychological-political-economic projects of some scope and magnitude. We also feel it is important to take the time to raise some of the issues, and then show how we dealt with them, and with what success.